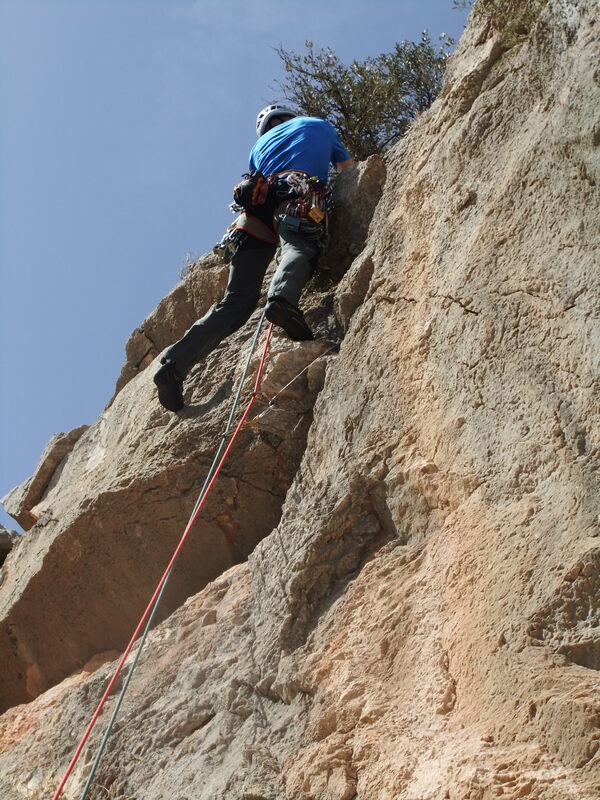 Ex CADET ROCK was an eight day climbing expedition to the Costa Blanca run by the Cadet Centre for Adventurous Training (CCAT). 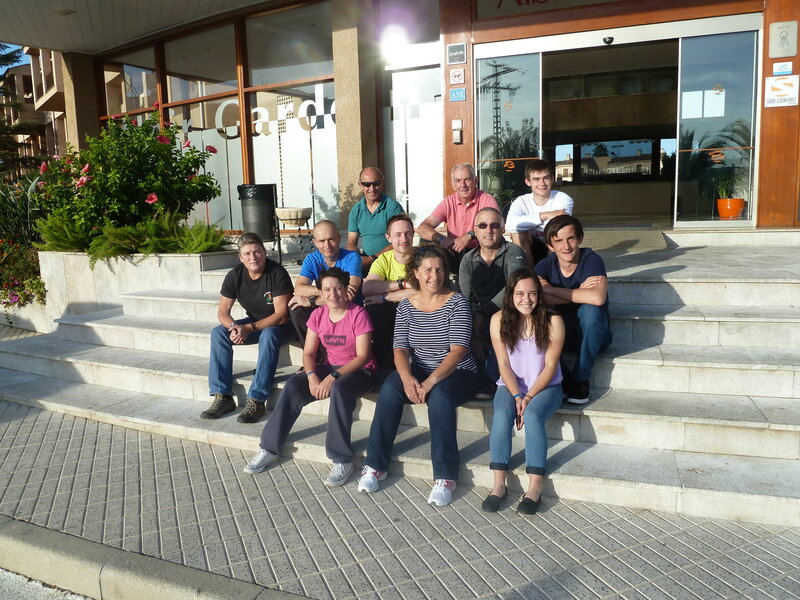 Four instructors which included Maj Kevin Edwards OC CCAT, Lt Col Cath Davies, Billy McIntosh and Dave Rees plus 8 x Cadet Force Adult Volunteers and Senior Cadets flew from Manchester to Alicante and onward by car to Altea arriving at the Albir Gardens Hotel, our base for the week. After settling in, the first task was to carry out introductions and find out what experience and abilities the novices had. This enabled pairs of climbers with similar abilities to be allocated to suitable instructors thus tailoring the RCF multi pitch course to the abilities and speed of development of the individuals. To give my experience as an example, the two senior cadets I climbed with had limited experience, having only completed the Basic Rock Climbing a year before and done little climbing since; on day one they were digging deep to remember how to tie a figure of eight knot! They both led three climbs each on the last day such was the huge leap in their ability and confidence. The aim of day one was to assess ability and confirm safety considerations such as belaying technique, quite important for the instructor who is leading! 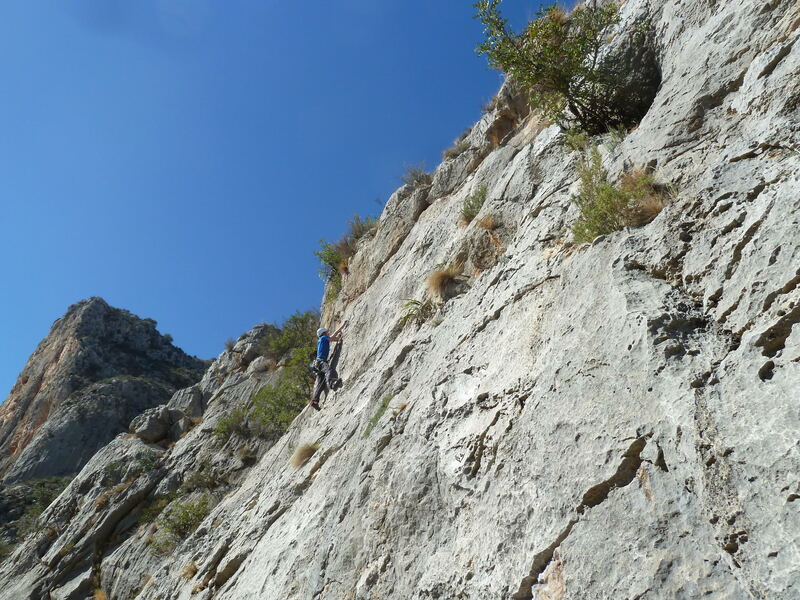 To do this, we went west to a fantastically varied area in the Vall de Guadar called Echo 1.5. This offered a single pitch venue with easy grades, a harder sport climbing area and some multi pitch routes close by. Thus everyone was catered for and the pairs began their climbing development at their own pace. We climbed single pitch whilst others progressed to multi pitch on the first day. The next day we travelled a bit further afield, west again, to an area called Marin. The advantage of being prepared to travel is you access routes less used and hence less polished. This was my team’s introduction to multi pitch climbing and we completed three two pitch routes of excellent quality (two in the top fifty climbs in the area) in a superb setting. The views were great, but the sun shone hot and there was little shade to be had, so the stop for ice cream and cold drinks on the way back was much appreciated! Day three we stayed more local and headed east to a rocky promontory called Toix, giving fantastic coastal views from a lofty position. The party split, half climbing on each side of the promontory. We drew the short straw as it turned out, because despite starting in the shade, once the sun hit us, it was the hottest day yet and our side had no sea breeze! Today’s development was to look at placing gear, belay building and carry out a stacked abseil on completion of a multi pitch climb, which we duly did, quite an experience for the novices. Day four took us back to the Vall de Guadar, this time for a traditional route on the ridge of the Paret del Castellet, Via Esther, a four pitch 2 star route with an exciting bush bashing finish to get off. The other group tackled two more serious multi pitch routes, again traditional, and had quite some adventures getting finished. That, however, is the advantage of rope groups working in the same areas as they can offer mutual support, meaning more challenging undertakings can be considered. Day five saw Kev and Cath head back to Toix Este, the other side of the promontory, whilst Billy and Dave headed back to Echo. We climbed a fantastic bolted and traditional route called Horst, which started off at 4+, then became easier at 4 and 3, allowing us to pre place runners and let the novices do their first lead. We had fantastic views over Calpe and the Penon de Ifach, that iconic mini Rock of Gibraltar sticking out into the sea where Spain turns left to head north to Valencia, and even a sea breeze. Flushed with the success of a first lead, we headed down to Calpe for a closer look at the Penon. Meeting the aspirations of the novices is vital, and our team’s wanted to go away confident in their ability to lead, set up a top rope and climb with a friend. To do this we returned to Toix Oeste, and braved the heat to practice building belays, lead climbing and setting up on single pitch climbs. Kev’s team did the same but moved faster and fitted in a multi pitch climb as well. 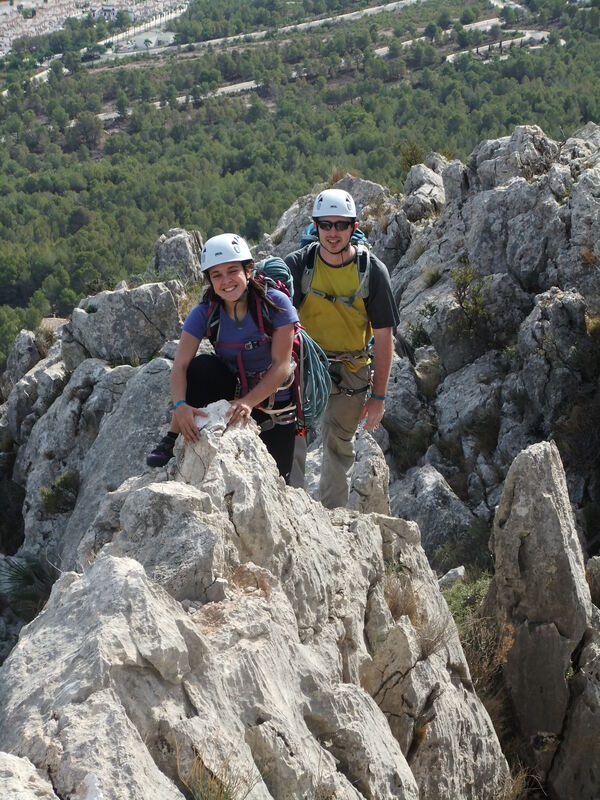 Billy and Dave took their more experienced teams off for a serious mountain day on the Bernia ridge, a 2.8km technical ridge with a bit of 4+ climbing and some fantastic views of the Costa Blanca. For Dave, this was a long awaited chance to finally tick the box, for the remainder of the team it was a long day! After a leisurely wander the ridge began with a bit of easy scrambling then the ropes were out and it was into full mountaineering mode on an exposed technical ridge. It was a great chance to put into practice all the skills learned throughout the week and although the teams just made it for their evening meal, it was a fitting finale. Our sincere thanks go to the Ulysses Trust who gave us a significant financial grant to make this exercise possible.